One of the remaining issues I have with my shop is the abundance of scrap wood. I have taken a huge step recently by just selecting any plywood that wasn’t perfect or too small and designating it for destruction. That made a difference, and there is still more to come. I don’t currently have any way to stock up on wood supplies though. I can’t take the opportunity of a trip to the lumber yard to pick up an extra piece of ply or two. I don’t have the capacity to pick up some boards of whatever species they have on clearance. I can’t just pop into the shop, decide I want to do something, and pick up something to work with off the shelf. A dream shop should have that ability, right? Storing plywood is pretty easy, it just takes up space. The trick there is to store it without it bending too much. If you can store it completely vertical, and ensure it stays that way, that’s the best option. Some sort of press to keep the ply tight up to each other if need be. I’m sure some amount of bend is okay, as long as they don’t warp. Board storage seems to me like a more complicated task, at least from someone who hasn’t had to deal with it. There is wall storage, but there’s only so much wall real estate. I saw a most impressive workshop on WWT that had an absolute ton of boards stacked vertically. Come to think of it, that’s how they are done at the lumber yard. Enough floor space, and a high enough ceiling, and that’s the way I would go. Otherwise, I might have a separate building for it to stack and dry. Two dream shops?!?!?! I’d have a small bin near the miter saw to contain small off cuts until I can figure out if I’m going to do anything with them. If I could absolutely swing it in the shop, I’d love a wood burning stove to burn anything I couldn’t use, real woods that is. That probably isn’t going to be an option unless I move out to the mountains, but I could (and might do soon for my real shop) build a fire pit that would be for family use and wood disposal. Have to do some research to see what’s not that great for burning. Not a fantastically entertaining entry, but I did promise it. We’ll leave the next entry as a surprise. Here’s more things I like. I updated the first post to include links to pictures representative of my ideas. 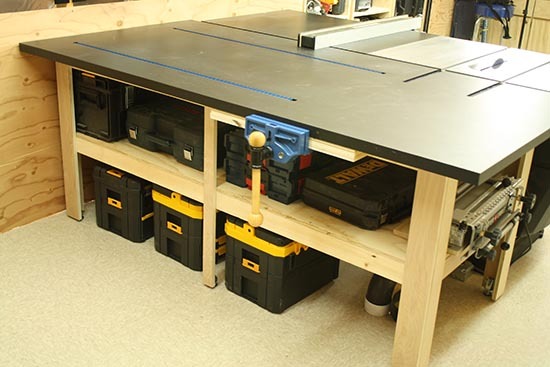 Last time I talked about a huge miter saw/RAS/mortiser bench and storage area. Now I move to the heart of the shop. In most shops, the table saw and outfeed table rule the day. I’ve been moving away from my table saw a bit just due to shop size, but no doubt if I had the room it would feature. This is where the size of the dream shop would come into play. If I buy another table saw, it’s going to be a good one. If 220v power is an option, of course a 3 or 5HP cabinet saw is the obvious choice. If I’m spending the money, it’s going to be a SawStop. I know all about the controversy with this brand, and in particular the inventor. I have been a part of it. I’m just looking at my future, and keeping the digits of myself and others safe. If by the time another device is on the market, I’ll evaluate my choices and make a decision. It would then become a decision on how wide I wanted the table. 36″ would probably be enough, but if it wasn’t that big of a difference to 50-52″, then no question. 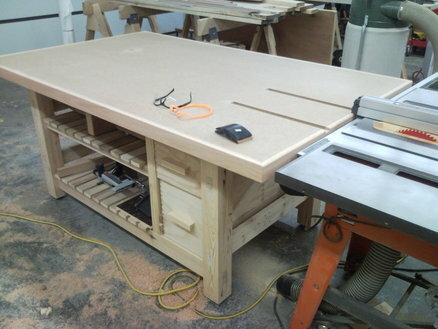 It really comes back to how much room do I have, and if I’m going to combine the table saw and router. It would be nice to have an Incra setup that covers both. The combination has been done. The outfeed table is really what is the focus here. What does a good outfeed table do? Well, it sits about an eighth of an inch below the saw surface, has cutouts for the miter bars (on a sled, usually) to exit the back of the saw surface, is as dead-flat as the saw, and will support anything that comes off the saw. You have ones that are attached, loose, drop down, etc. If shop size isn’t huge, I’d build my outfeed table slightly bigger and double as an assembly table. 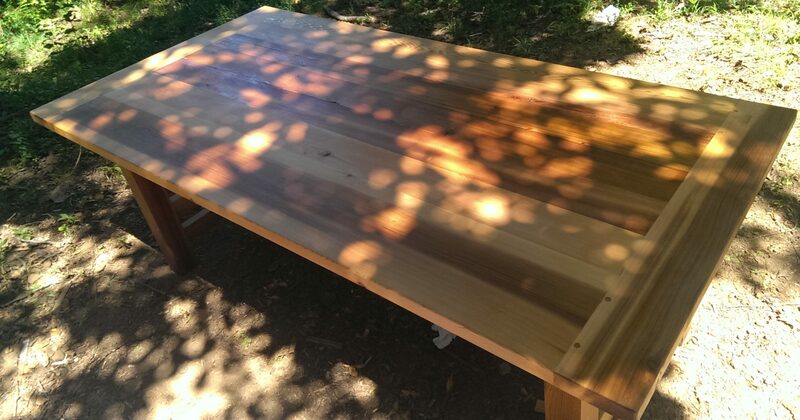 The extra foot or so on all sides would be much less room than a 32 square foot or so dedicated assembly table. The top would be a torsion box design, with storage underneath and room for dust collection to be routed, if necessary. Integrated power and perhaps air ports, or those can be dropped down from the ceiling. A sheet of hardboard or similar could be used to shim the table flush with the saw, making an assembly area even bigger. What I don’t know at this point is if I would want the top to be solid or not. What I mean by that is, with some assembly and construction tables, you can use T-track embedded, 20mm holes like in an MFT, etc. Would I want that? Would I have a need for that? I would think for actual assembly, using parallel or other clamps would be sufficient. I suppose, hopefully having room for an MFT or two, the lack of ability to use smaller clamps or stops wouldn’t be an issue at all. I would hope that would be the plan, so for now I’d say that a ‘solid’ top to an outfeed/assembly table would work. If I didn’t have room for a big vertical air compressor, I’d try to bury my hot dog compressor underneath with some sound deadening and a way to drain the tank when not in use. I know that having air handy right there would be good. I would hope I would have somewhere else to sand, but if not a Festool CT there, or one that could be wheeled over would work. Next time, I’ll discuss wood storage. Well, after the latest round of projects being mostly complete (which is about the goal for me, unfortunately), I’ve got some time to kill and some content to create. There’s only so much I can write about moving this one little thing a few feet over to this spot, and etc. So, what to write about when you are in a writing mood? There’s always the old standby of a dream shop, right? I’ve done the dream shop talk before though. I even designed one, right before I was crushed back to reality. I thought that this time, I would illustrate some really good ideas that I find that I would integrate into a shop, if only I had the room. As such, this might be a post that is several months in the making, or could be a little series. 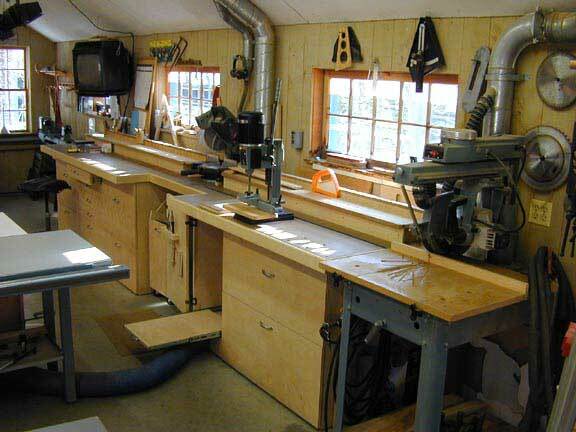 One of the things that I’d like, should I have the room, is a super long miter saw bench. I’ve always wanted that, I want it in this shop. 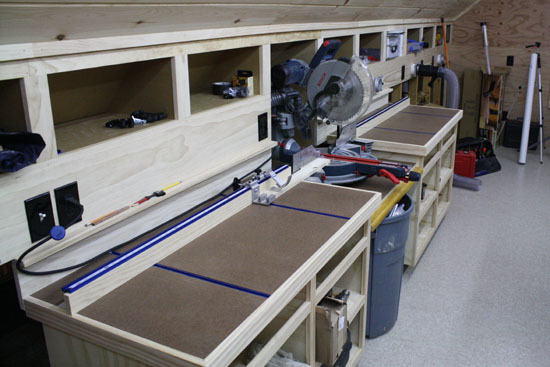 A component of the long miter saw bench is storage above and below the work surface. My miter saws have been pretty dang accurate, so I don’t have a problem using them for final length cutting. Depending on the layout of said shop, the storage below would either be drawers for various things, Systainer storage, or a combination of both. I think above the saw shelf would be a combination of cabinets and board storage, depending on how long that particular wall was. The work surface would have the hollow chisel mortiser inset into the surface, with the fence being a common fence to the miter saw. Both operations could be done in the same space without too much trouble except for the thickest boards. What would really set it off would be a radial arm saw in this setup. I’m clearly influenced by Norm Abrams’ shop (Morash’s, actually). I’d love to set a dado up in one and do crosscut dados. I think if I was still faced with a space issue, I might eventually upgrade to the Kapex. If not, the only reason why I would part with my Hitachi would be the dust control issue. For me to spend $1500, I had better absolutely need it in some capacity. I love tools, but why spend it when you don’t need to? The Craftsman HCM would stay until it proved itself unworthy, and I have no idea what brand of RAS I would get. Until next time. Here are some good examples of what I’d like to have, each with their own positive attributes. Links, because I don’t want to be accused of stealing.